At Home with the Hinkleys: In Defense of Intolerance. It about to get controversial up in here, ya'll. 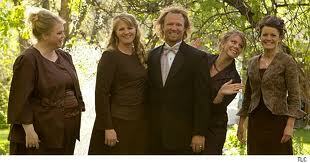 So if you follow me on Twitter, you might be painfully aware of my snarky Sunday night tweets during Sister Wives. I watch this show religiously because I mainly love to hate it, and it is super interesting to see the kind of feedback the #sisterwives feed gets as the show is airing, aside from 1000 people every week saying "I don't know how anyone can share their husband #gross." Yeah, we get it and have moved past that point, thanks. I have zero qualms with acknowledging that I am judgmental. I think it is perfectly fine for people to be judgmental, and regardless of my thought on it, we all are whether we admit to it or not. Even if you don't even realize it, the fact that scientists can conclude that someone named Joe Smith will be hired 90% more often than DeShaundra Williams makes a pretty inarguable point if you are generalizing. The problem with being judgmental is when you aren't a fair judge. But those who automatically assume being judgmental is a bad quality, I ask you this: do you think serial killers and child predators are bad people? Boom, roasted. That being said, under normal circumstances, I find it unnecessary to pass negative judgment onto 99% of people I encounter in life. One of the things that bothers me about the show and its tweeters (aside from the low level intelligence that the Brown family seems to collectively have, minus Jenelle) is how everyone wants to be a white knight for tolerance. I don't think we should be so tolerant about everything. You know how every grandparent on the planet thinks the whole world is going to hell in a handbasket? This is thanks to tolerance! (joking, but only sort of) I mean, People of Wal-Mart, my Mom reading 50 Shades of Grey, Toddlers in Tiaras (and the voyeuristic nature of all the TLC shows I watch) are allowed to happen because people value tolerance. If you aren't already thinking about what I terrible person I must be, hear me out. I consider myself to be a pretty fair judge of situations and such, and I am tolerant of all people of all shapes, sizes, genders, orientations, etc. It is their choices when I get a little judgey. I know right from wrong, and I won't pretend something is right just because nice people are doing it. You can stand up for what is right/true, or you can be tolerant. I think the Brown family falls into a grey area for a lot of people, but not me. The people are perfectly fine people, I don't begrudge them for being unkind or anything terrible. I take issue with how their 'church' is Kody (the Dad) preaching to his family about whatever it is they talk about in their living room. It seems like a perfect storm of mind control. Like what would my form of church be if I just sat Aaron down and told him what is what without any sort of theological training, agreed upon doctrines to follow or whatnot. "God proclaimed for you to take out the trash, and stop burping all loud and gross all the time!" Pretty self serving for Church, huh? I think it is flat out adultery, even if you are 'married' to these other people. The adultery rule wouldn't even be a thing if you could just get 'married' to whomever once you get tired of the older wives. What does Kody have to overcome in the regard of staying faithful and working on staying in love with someone for your entire life? #monogamousproblems. I also find in incredibly unfair that pretty much Janelle and Kody are the breadwinners of the bunch. So Janelle has to raise her 6 kids, work full time, and her reward is paying for the roof over the rest of the 15 family members. And she gets to hang out with her husband 1.75 days a week. Screw that! It is no wonder she has stated that she wanted out of this on a few different occasions. And lastly, I don't know their whole financial deal, but being an accountant, I can't help but wonder if they are in on the welfare fraud that is one of the big reasons why the government even cares to ban polygamy. Because Kody is only legally married to Meri, and they have 1 kid (fertility issues). So Janelle, Christine and Robyn file their tax returns and look like single moms with 6 kids a piece (more or less). Probably not Jenelle so much because she works, but stay at home moms Christine and Robyn probably get a load and a half of Earned Income Credit money and child tax credits if I had to make a guess. That is money out of America's pocket! So yeah, I am not a fan of their lifestyle one bit, and I am not shy about expressing it. Another reason I love to snark on them is just because I am mean and I find them insufferable. I know it isn't good for me to be working out my mean muscle in this fashion, but I am doing so in a way that increases their popularity and fame, thus getting TLC to keep them on for future seasons and such, so I don't feel that bad about it. I suppose I will leave it at that. I hope I have encouraged you all to add a little intolerance in your life. lol. Thoughts? Am I totally off base here? I'd love to know your take! Completely agree with you on everything! I only watch the show for the train wreck that it is. I totally agree! Since when did tolerance become the highest virtue in the world? Some things truly are bad and should be judged to be bad things.